In the 22 months since the Utah Legislature met to first consider crafting a health-care plan, there's been a lot of talk—but no action. In January 2014, Health Affairs Journal published a study by Harvard University and CUNY researchers that estimated between 102 and 316 Utahns have died because they didn't have access to health care. The liberal advocacy group Alliance for a Better Utah projected that number today could be as high as 360. After Utah House Republicans rejected the latest proposal to expand Medicaid, it appears Utahns needing care will have to wait still longer. The Affordable Care Act (ACA) made it possible for states to expand Medicaid and provide health insurance to those who fall into the "coverage gap": people who earn too little to receive subsidies for private health insurance, but earn too much or otherwise don't qualify for Medicaid in Utah. So far, 30 states plus the District of Columbia have opted in; 19 have declined outright. Utah has done neither, and is instead trying to come up with its own version of Medicaid expansion. Over the past two years, the Utah Legislature has rejected several proposals to cover all or some of the Utahns in the coverage gap, many of whom are working families. The first such plan was outright Medicaid expansion, which would have covered every Utahn in the gap. Gov. Gary Herbert's "Healthy Utah" plan was defeated during the 2015 legislative session. Other plans that members of the Legislature came up with—Utah Cares and the so-called Frail Utah plan—met similar fates. The latest plan to meet with the Legislature's ax was the highly anticipated Utah Access Plus plan, brought forward by the so-called Gang of Six—which included legislative leaders, Herbert and Lt. Gov. Spencer J. Cox. The plan would have expanded Medicaid, and paid for it through sharp increases in fees paid by health-care providers. "[The Utah Access Plus plan] made everybody mad," says House Speaker Greg Hughes, R-Draper, one of the Gang of Six. "The doctors are mad at me, the hospitals are mad at me, conservatives are mad at me, Americans for Prosperity are mad at me. So it's not a plan that's done me any favors. But I did believe that it was the only straightforward way we could afford this." 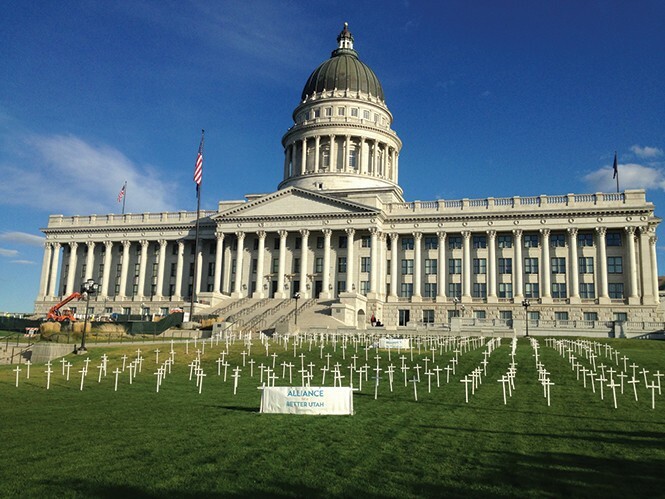 Advocacy groups such as the Utah Health Policy Project (UHPP) have been outraged by the House's inability to act. "What we're seeing is a little bit of a Groundhog Day movie-type scenario," says UHPP communications director Jason Stevenson. A significant number of Utahns are impacted by the Legislature's inaction, but even that doesn't seem to be enough to get lawmakers' attention: "This is a real issue. The coverage gap [in Utah] is 50,000 to 60,000 people" Stevenson says. Rep. Edward Redd, R-Logan, is a primary care physician who says he's concerned with the delays. "Over the years, I've taken care of a number of patients who didn't have health insurance," Redd says, "and because of that, they didn't get treatment in a timely fashion and ended up passing away at relatively young ages." Redd says that many of those who have died are people with chronic illnesses, such as diabetes. Such patients can get very sick very rapidly: "Even though the illnesses are treatable, because they don't have money, don't have a credit card or anything, I end up getting a call from the sheriff's department letting me know my patient is dead," he says. "It gets quite frustrating knowing that many of these people could have survived if they'd had adequate health care." The system's inability to prevent these needless deaths troubles Redd. "It's really quite a disturbing experience, and one that's happened too many times over the years. I try to do the best I can, but so many of these people need additional services that I can't provide—like specialists, lab work and things that they just can't get for free," he says. Hughes says he shares that frustration, but that he believes the political will exists in the Utah House to get uninsured Utahns some type of coverage—if only lawmakers can think of some new way to fund it. "Absent a revenue source," Hughes says, "we can't do it." On Oct. 13, after House Republicans voted in the party caucus to reject Utah Access Plus, Hughes says there's no way forward for Medicaid expansion through any type of traditional fee assessments. Crafting a solution that House Republicans can agree on "is a tough nut to crack," he said. Still, Hughes is pleased lawmakers have begun to focus more on the people who need care and less on finances. The 2016 legislative session is right around the corner, and the health-care debate is expected to once again be a marquee issue. UHPP's Stevenson says he suspects the Frail Utah plan might make a comeback, but UHPP strongly opposes it. "[Frail Utah] is a plan that came out of the Legislature's Health Reform Task Force last December," he says. "It covers only a small portion of the coverage gap: those who are medically frail, and those leaving incarceration." Stevenson says not only does Frail Utah do too little—covering only about 10,000 of the 50,000-60,000 people in the gap—what little it does could make matters worse: "Because it covers only the sickest, it creates a race to the bottom where everyone has to get sick enough to qualify for the plan," he says. "It's an incentive to become sick as opposed to an incentive to get better." Hughes says it's premature to make predictions about what might happen next. "We're all political junkies, and we all want to know what the next plan is. But I can honestly tell you that anyone's guess is just that—a guess," he says. "The Health Care Task Reform Task Force will continue its work ... taking in new information and feedback." Hughes says that while the process is dragging on too long, it will be better in the long run than adopting the ACA. "We have to know how we're going to pay for this, we just have to," he says. "It's so easy to be one of the 31 states who have accepted the full Medicaid expansion, because the feds are paying the full ride right now," says Hughes. "And yes, we could just start accepting those federal funds right now. But, good or bad, Utah is taking the longer view, and we've got to know how we're paying our portion." Hughes says he forsees an approved plan by the end of the 2016 legislative session—and, whatever it may be, it's sure to be a step in the right direction. "What we do will be better than what we have today in terms of not having any coverage," he says. "Will it be as rich or robust as Medicaid expansion? Probably not. But we are going to find a way to provide care for those who need it."